While other cars always have to ferry around their puffed-up exteriors that can accommodate up to seven passengers even if they’re just transporting a single soul, the „iChange“ features an adaptive body. The sole driver is conveyed in a teardrop-shaped car that offers optimal aerodynamic properties and thus minimized energy consumption. If more than one person need to be transported the expanding rear provides room for two passengers. As a result of the increased weight and no longer optimal aerodynamics the energy consumption increases - but only for the time passengers are actually on board. An initial walk-around reveals that the concept car has no doors. The entire electrically powered roof section of the car measuring just 1.03 meters in height tilts forward to allow passengers to board. Also gone are such mundane things as a key. Its role is filled by an Apple iPhone, which also controls the most important vehicle functions. The „iChange“ is drastically different than ordinary cars in every detail: At the heart of the concept car lies the groundbreaking next-generation Harman/Kardon infotainment system. The system uses an innovative Intel processor technology that guarantees minimized power consumption. The same is true for the Harman/Kardon high-efficiency audio system. This revolutionary technology meets highest demands on sound quality, weighs much less than ordinary systems and at the same time uses only a fraction of energy. This opens the door to a new dimension of energy efficiency. The route guidance of the navigation system is also especially eco-friendly: The system calculates the most energy-saving route and displays the directions in realistic 3D view. Eberspächer Group from Esslingen, Germany is one of the world leaders in car heaters. Specifically for the „iChange“ project Eberspächer developed custom-tailored electric and fuel-burning heating systems. Both systems are geared toward the specific requirements and conditions of electric vehicles. The pure wool used in the interior was further refined into high-tech wool by Schoeller using state-of-the-art processes. The wool is spun and died in accordance with the highest eco standards. It provides an extremely extravagant ambiance in the ‘iChange,’ looks stunning and is delicate to the touch. The competence partner Strähle + Hess transformed this natural product into a striking interior. Its surface character and materiality combine to create a symbiosis of shell, firmness and frothy air. Unconventional techniques create unusual surfaces. The seams of the seats are reversed and the removable seats cushions are adorned with the prototype’s name. Xmobil provided further customization services. While textiles can be found in the „iChange“ in their original form in other areas, they are newly interpreted on seats and cargo floor using various refinement techniques such as braiding and gathering and a combination of both. Leather strips alternate with technical textiles. The seat cushions are interchangeable, braided felt alternates with technical textiles formed into three-dimensional shapes. This transfers the adaptive concept of the „iChange“ to the interior as well. The diamond-coated anti-slip floor is supplied by abrasives specialist KGS. Frank M. Rinderknecht used highly advanced technology and a Swiss-based network of top automotive specialists for his project. So the Rinspeed “iChange” fits perfectly to Esoros motto: engineered by Esoro - What you dream is what you get. The Motor Show in Geneva is traditionally the place where Frank M. Rinderknecht presents his visions. For years he and his company Rinspeed have been presenting environmentally-friendly, practical and extravagant creations, which offer possible solutions for the future of automobiles. And now joining him for the third time is: AEZ, the renowned manufacturer of premium light-metal wheels. Following the eXasis and the underwater car sQuba, this time the perfect alloys had to be found for the “iChange”. Norbert Frohner, the General Manager of AEZ, said the following: “As with the sQuba we have created a new wheel, which works almost directly on the blank forging. The task was just as complex as last year, but also just as different. Although the “iChange” can’t go underwater, it is extremely diverse on land – and that’s precisely what the wheel intends to demonstrate." Frank M. Rinderknecht’s latest development is actually a vehicle which adapts to diverse conditions: First and foremost, thought, the “iChange” is a thoroughbred, futuristic sports car. The AEZ alloys support this by looking like the wheels on a classic Bugatti - and that suits the streamlined design of the Rinspeed. In this form the “iChange” is a fun car for one person, but “when the rear is raised as if by magic” it changes in the blink of an eye into a small sports van for three people. The double spoke wheel also takes part in the metamorphosis; it fits the spatial wonder like a glove even when the focus is shifted to the adequate transportation of people. Dynamics meets versatility - that is this year’s topic from Rinspeed. Rinderknecht says: “If we want to maintain our individual mobility in the future, then we will have to rethink the car disregarding all taboos.” That also means that the vehicle has to adjust to changing conditions. And that explains the name “iChange”. The vehicle concept also comprises, of course, the vehicle technology, as it also has to adjust to future demands. As is normal with Rinspeed, environmental protection is in the foreground: an electric engine with 150kW (204 HP) offers decent thrust without harmful emissions. With its large, enclosed surface, the wheel from AEZ provides even better aerodynamics - it helps to extend the life-span of the battery and increase the sports potential of the “iChange”. Designers and technicians at AEZ have designed and built an expressive, spectacular alloy for an extraordinary car. It represents the high-point so far in the cooperation between the wheel producer and Rinspeed. Common philosophy, new project: Cars which can drive on water, cars which can drive under water, cars with transparent bodywork. The concept cars developed by Frank M. Rinderknecht interpret mobility in a different way. They are the work of a person, who quietly goes his own way. Just as Carl F. Bucherer, founder of the Lucerne watch brand, used to. This was one of the reasons that CEO Thomas Morf and Marketing Manager Bruno Jufer decided to support Frank M. Rinderknecht and his ideas. However, an even greater influence was the common philosophy shared by Carl F. Bucherer and Rinspeed, demanding technology, top class materials and amazing shapes, all contributing to an innovative, conceptually convincing final product. From the sports car to the van: This common philosophy is also foremost in the latest Rinspeed-Project. The “iChange” is a „1-2-3-seater” with a 150kW-e-motor, whose eye-catching body shape adapts to the number of passengers by electronic tail magic. At the touch of a knob, one can convert the single person sports car into a small sports van for three people, exactly like the motto “I change”. As well as in its design, the “iChange” reveals its innovation through its extremely low energy consumption: the car drives without exhaust emission and boasts a weight and wind resistance reduced to their minimum. So the Rinspeed “iChange” demonstrates a high potential in the area of durability, which also represents part of Frank M. Rinderknecht’s motivation: “We have put a flexible vehicle on wheels and, in so doing, the themes of the varied and constantly changing energy requirements meaningfully thought right through, to take the ecological aspect fully into account”, maintains the car tinker. Highest Swiss quality: Innovative thinking, the belief in one’s own way and today’s theme of durability are also of the utmost importance for Carl F. Bucherer components, and explain why the Lucerne watch manufacturer is collaborating on this project with Frank M. Rinderknecht. “The Rinspeed „iChange“ stands for change, future-orientated technologies and great passion. This embodies the Carl F. Bucherer philosophy in a unique way”, explains Bruno Jufer, Executive Vice President Marketing. The “iChange” will be presented to the public for the first time at this year’s motor show in Geneva, taking place from 5th to 15th March. Carl F. Bucherer will be there with Rinspeed. All in all, the credos of the “iChange” and the watch models of Carl F. Bucherer go perfectly together: the highest Swiss quality and efficiency, combined with the perpetual search for perfection. Die Agentur develops integral communication solutions. Our services include everything from classic communication and design to photography and interactive applications. We further expanded with the establishment of our In-House film production, called Movie Division. Clear, straight to the point and exceptional communication is our philosophy. Therefore, it is self - evident that an innovative customer such as Rinspeed is attended to with great care, enthusiasm and passion. Die Agentur was nominated for Germany’s most popular design award 2009. As do all electric vehicles, the “iChange” from the Swiss design house Rinspeed relies on a powerful, but economical in-cabin heater: The electric motor simply does not generate enough waste heat to use for heating the passenger compartment. The concept car appeals because of its transformability not only with regard to its body, but also with regard to heating, and offers two attractive alternatives. The Eberspächer Group - headquartered in Esslingen and one of the world’s leading manufacturers of vehicle heaters - developed both a perfectly fitted electric heater and a custom-engineered fuel-powered heater specifically for the “iChange” project. Both systems are designed to meet the specific requirements of electric vehicles. With the electric PTC air heater from Eberspächer catem - global leader in the field of electric auxiliary heaters - the “iChange” is fit especially for short trips and city traffic: The prototype that was developed specifically for the Rinspeed project was designed for a nominal voltage of 580 volts. Thanks to its fully insulated construction, the PTC heater is safe from an electrical standpoint. Because of the aerodynamic shape of the corrugated ribs, the heater body exhibits only a minimal pressure drop on the air side. With a heating capacity of 5.6 kilowatts, the electric in-cabin heater achieves a high power density in spite of its extremely compact size: The dimensions of 228 x 167 x 36 millimeters mean that the air heater requires very little space for installation. Other benefits: The heater’s efficiency - the direct energy conversion from electric energy into thermal energy - is 99 percent. In addition, no pollutants are emitted during operation of the heater. As a result, the PTC heater is ideal for zero-emission vehicles intended for use in congested areas to keep the air clean.Electrical pre-heating of the vehicle by a park heating function is also possible - especially during the charging process. For longer trips the Eberspächer Airtronic is the right choice: Since the fuel-powered heater puts no load on the vehicle’s electrical system, the battery capacity is available entirely for driving purposes. In this way, the “iChange” achieves a considerably greater scope. The Airtronic, also designed specifically for the concept car, consumes about maximum of 0.43 liters per hour of heating and has been engineered especially for the combustion characteristics of the alternative, eco-friendly fuel E-85 ethanol. The small 3.5-liter tank disappears cleverly behind the license plate. The major benefit of the Airtronic is its high energy efficiency: With an efficiency of 84 percent - based on the primary energy input - it excels when overall CO2 emissions are taken into consideration. Equipped with a catalytic converter and with nitrogen oxides and particulates filtered out to almost below the detection limit, the Airtronic appeals not only because of its positive ecological features, but above all because of its rapid heat output. Moreover, the unit has all the convenience features of a regular Eberspächer park heating: In the winter, the passenger compartment can be pre-heated and ice-covered windows cleared without the need for scraping. In the “iChange”, Eberspächer has exemplified two different air heating systems for electric vehicles. Use of electric or fuel-powered water heaters produced by the company is also conceivable. Integrated in a cooling water circuit these kind of heating systems are able to pre-heat the sensitive battery in the winter - holding it capable of cold starts - and cooling it in the summer. Besides electric water heaters are able to use the waste heat of power electronics, motor and other users for heating proposes and support so an overall thermal management. "One does not discover new lands without consenting to lose sight of the shore for a very long time”. Harman Becker Automotive Systems, the Automotive Division of Harman International, truly lives this tenet of French author André Gide, and introduces more than just one energy-efficient audio and infotainment solution in the Rinspeed “iChange” zero emission concept car. And this without any compromise in performance and enjoyment. The partnership with Rinspeed and the sponsoring of the “iChange's” development and fabrication put KGS once again ahead of the competition. Synchronizing people and businesses with the ever-changing world is a cornerstone of the KGS culture. KGS is proud to participate in this project. Together we prove that the future is promising for businesses and people embracing change and possessing the values vital to navigating changing times. Pirelli Tyre is the world's fifth largest operator in terms of turnover on the tyre market, with levels of profitability among the highest in the sector. Pirelli Tyre is today the operational holding company for a group involved in the design, development, production and marketing of tyres destined for various types of vehicle: cars, light vehicles and motorcycles (Consumer sector, 70% of revenue), buses, trucks, agricultural and earth moving machinery, and the production and marketing of steel cord (Industrial segment, 30% of revenue). Within this market, Pirelli Tyre focuses in particular on the high-end segments characterized by elevated techno-logical contents and high performance. These are segments in which Pirelli has established itself in positions of leadership with regard to both its car and motorcycle tyres: Pirelli tyres are today seen as synonymous with quality, emotion and ultimate performance. Drawing on its technological expertise, the group has consolidated working relationships with the world's leading car and motorcycle manufacturers; partnerships that have translated into a number of homologations for models from all the leading automotive firms. The Schoeller Group, which has its headquarters in the Austrian city of Bregenz, is one of the leading worsted yarn manufacturers in the world. 500 employees produce 4,000 tones of yarn a year at various locations across Europe. One and a half centuries’ worth of experience, coupled with an innovative Research and Development department, is the reason why its technological advancements are constantly being expanded upon. Schoeller’s corporate mission statement leads the way with its fixed policy of sustainability. This also explains why Schoeller was the first ‘bluesign’-certified spinning mill in the world to be awarded the prestigious ‘bluesign Award’ - ‘bluesign’ being the comprehensive environmental and eco quality seal. An important part of the Schoeller customer portfolio is the ‘traveltex’ segment, i.e. fibers used in cars, buses, trains and airplanes; several of the fibers are even used in space travel, making them some of the most widely travelled threads around. Schoeller develops yarn innovations in close cooperation with industry partners, enabling the design, amongst other things, of novel seat covers, door trims and ceiling solutions. The implementation of the Rinspeed study „iChange“ meant that the Vorarlberg-based employees could fully put their strengths in sustainable development and production to use. The materials utilized for this project heralded the return of a fiber long and unjustly neglected in favor of man-made fibers - pure wool. Its very nature means that wool offers more functions than traditional synthetic fibers and is vastly superior even to cotton in terms of environmentally friendly production and waste disposal. The wool was refined into high-tech wool by Schoeller using newly developed processes. Spun, colored and finished according to the highest environmental standards, it offers an exceptionally high-quality look and feel as part of „iChange“. Alongside its optimal ergonomic characteristics, the wool also offers a particularly attractive visual effect and pleasant feel for seat covers. In addition, thanks to its special ‘coldblack’ finish, the high-tech wool guarantees a warming and UV-absorbing function for ceilings, thus ensuring a pleasant temperature in vehicles. Positive proof that being environmentally friendly does not necessarily mean having to do without luxury and comfort. The well-known Swiss design and concept company Rinspeed is working in collaboration with the leading LCD TV manufacturer Sharp on the new "iChange" concept car. An extraordinary vehicle deserves a unique introduction. And Sharp is making sure it will get one with the latest full HDTVs (best HDTV picture quality via high resolution full HD displays), which will highlight the ideas and characteristics behind this revolutionary vehicle for the viewer in a needle sharp color brilliance unlike any other before. 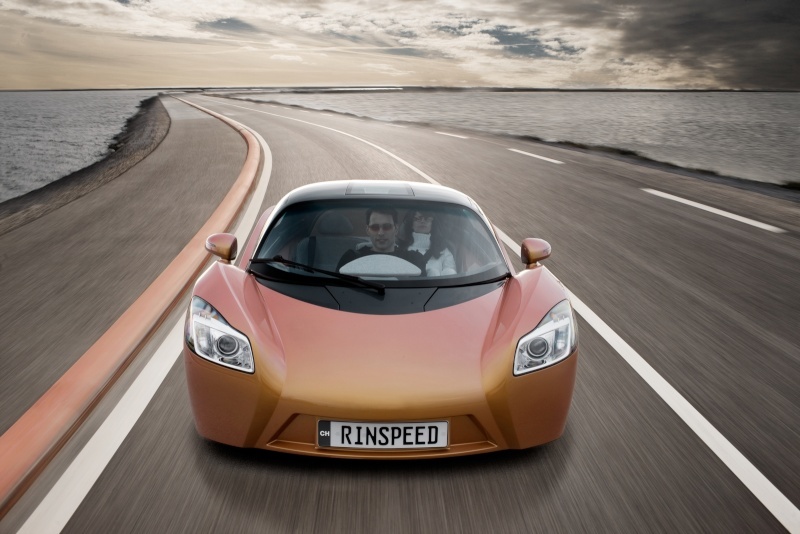 Siemens’ Corporate Technology Department (CT), the company’s central research unit, is contributing an integrated system – comprising a motor / generator, power electronics and a battery-connected interface - for the “iChange”, Rinspeed’s latest car model. As a world-leading supplier of power systems and environmental technologies and a provider of products covering the entire electrical value chain (generation, distribution, utilization), Siemens has long been a pioneer in the field of electrical drives systems. Regenerative energy concepts are the key to fossil-fuel-independent energy supplies. Serving not just as means of transportation but also as mobile energy storage units that can be used to supply energy in public power grids over the medium term, electric vehicles may provide such concepts’ mobile and flexible components in the future. But before this can happen, energy and communications interfaces will have to be standardized to create a power network that enables system-wide coordination of the rapid power feed and feedback process. For this reason, safe and simple “filling up” and the securing of network stability are both key focuses of the research partnership with Siemens. To guarantee optimal efficiency, a car’s electric drive, battery, power electronics and communications with the power grid must be oriented toward its twofold function as a mobile power storage unit and a vehicle. That’s why Siemens is working on a new concept for controlling and coordinating internal vehicle functions and power flows to the grid - since electric cars will not be able to establish themselves on the market until both grid and vehicle work hand in hand. Boasting some 3.000 researchers and more than 55.000 active patents, Siemens’ Corporate Technology Department is a world leader among technology company research networks. Innovation is Siemens’ most important growth and productivity driver. In fiscal 2008, the company invested €3.8 billion - 4.9 percent of its total revenue - in research and development. As an integrated technology company, Siemens is pushing developments in the field of electro mobility, both at the Corporate Technology Department and at the Energy and Industry Sectors. Work is focusing not only on the requirements relating to the electric car itself but also on the associated power supply infrastructure. Intensive efforts are underway in areas such as power generation and distribution, traffic and energy management, smart electricity meters, power electronics, software and sensor technology and, of course, electric drives and the recovery and storage of energy. Electric vehicles could prove to be mobile and flexible components of a largely fossil-fuel-independent power supply in the future. For instance, they could compensate for power supply fluctuations that may occur with wind and solar energy. Not only can electric cars store excess energy from the power grid; they can also feed it back into the grid as required. Because electric drives make much more efficient use of energy resources than combustion engines, they could well become a key element in Siemens’ Environmental Portfolio. Already in fiscal 2008, the products and solutions in the Environmental Portfolio generated revenue of €19 billion - roughly one-fourth of the company’s total revenue. Ours is a fascinating time. The world has reached a period of thorough reorientation. Economic crisis, climatic change, and cultural wars enforce a revision of opinions. In every crisis, though, there hides a chance. We at Strähle + Hess cherish this chance! We mirror it in the development of an interior, fit to change its shape constantly – enabled to adapt quickly and flexibly to new challenges in ranges previously undreamt of. We set out to create the world’s most versatile in-cabin space. This challenge has to be realized on an ecologic base - just like every single one of our innovative concepts. Following the motto “Put everything to the test, keep what prevails.” we chose to revive a very special eco-material for our interior: wool. Wool is a material with excellent technical specs - and a long tradition of usage in automotive in-cabin constructions. In the starting years of the automobile, the ladies and gentlemen traveled on wool while the drivers had to content themselves with leather seats. We herald a renaissance of wool in car interiors. Thanks to our excellent partner Schoeller Wool Ltd. we were able to adapt and functionalize every single interior component in wool. Our successful cooperation with Frank Rinderknecht continues with the “iChange”. Thankful to Mr. Rinderknecht and his Rinspeed-team, we are looking forward to a future, in which one will be able to adapt even more flexible to the challenges of automotive daily life. Strähle + Hess Ltd. - profiling ideas. Founded in 1926 the company produces highly specialized technical textiles for car interiors. In Althengstett near Calw (40 kilometers to the west of Stuttgart) 150 employees design, develop, and produce state-of-the-art seat components as well as textiles for casings and gasket systems. With its high potential in experience and know-how as well as its many patents and demand-oriented engineering services, the company is one of the leading international suppliers of textiles - exterior and interior - for the automotive field. The innovative and versatile company joined the Sellner Group in 2007, thus taking another step towards long-term development at the market. Since the foundation of Xmobil Design + Marketing GmbH in 1997 by Christian Grübl the company has extended and diversified its development and product program continuously. Xmobil is mainly acting as an independent marketing and development partner of well-known European manufacturers and suppliers in the automotive and furniture industry. Utmost attention is turned to aesthetics, functionality, quality, innovation as well as ecology. Xmobil’s mission is mainly understood in the continuous support of the customers and suppliers in the market by consulting, project support and communication among the partners. By cooperating with flexible and highly productive suppliers provided with European production sites and worldwide marketing channels, Xmobil turns new ideas into products and supplies them to the industry and the wholesale trade. The following materials and products form the base of Xmobil’s development and marketing activity: Leather, artificial leather, technical and fashion fabrics and a combination of these materials. Leather fittings, seat covers, seating systems, floor mats in textile, velour, rubber or a combination of these materials, covers (indoor, outdoor, transport, presentation), accessories and lifestyle products. High-quality furniture, wall and floor panels for different areas.